MainAll NewsInside IsraelIs Herzog on the way to the coalition? Is Herzog on the way to the coalition? Likud source denies reports that Netanyahu asked heads of coalition parties to opine about the possibility of Zionist Union joining. 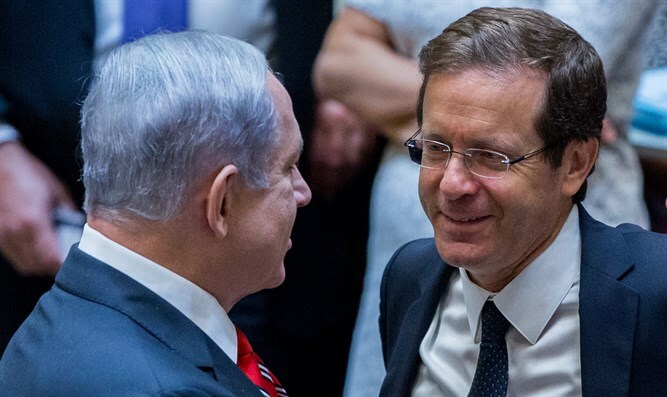 The Likud denied on Tuesday evening reports in the media that Prime Minister Binyamin Netanyahu had asked the heads of the parties in the coalition to opine about the possibility of the Zionist Union party, headed by MK Yitzhak Herzog, joining the coalition. The source added that the Prime Minister has always made it clear that he would be interested in widening the coalition but so far this has not happened, and that in any case of be further expansion of the coalition, it would be coordinated with all the parties in the existing coalition. The comments follow an earlier report in Haaretz, which said Netanyahu addressed the participants at the weekly meeting of the coalition party leaders and asked each of them whether they would be for or against the inclusion of Herzog in the coalition. According to the report, not all the heads of the parties were in attendance at the meeting. Only Kulanu chairman Moshe Kahlon, Shas chairman Aryeh Deri, Health Minister Ya’akov Litzman and MK Moshe Gafni, who heads the Finance Committee, were present. None of them objected to the idea of Herzog joining the coalition. Netanyahu worked hard to convince Herzog to join the coalition several months ago, but the talks on a unity government reportedly fizzled over Herzog's demand for a unilateral division of Jerusalem, among other things. The talks appeared to be over when Netanyahu joined forces with Yisrael Beytenu and Avigdor Liberman, but Herzog later hinted that his party would reconsider joining the coalition if Netanyahu ousted the Jewish Home from the government. Recent reports, however, claimed that Netanyahu and Herzog had restarted the talks and had met one-on-one several times. Both sides denied the report.